7 Best Above Ground Pool Cleaners — Find Out the Best Value Cleaner on the List Right Now! Having a pool at home keeps your family and friends entertained and cool, especially on hot months of summer. Most pool owners have above the ground pool in their home because it is less expensive, and it is easy to maintain. No matter what type of pool you have, it is essential to maintain its cleanliness. A clean pool is an enticing pool. Of course, no one wants to dip and swim in a filthy pool. Also, a dirty pool might be a breeding ground for mosquitoes. There are professional pool cleaners you can hire to clean your pool, or you can do it by yourself. For DIY cleaners, there are different types of above ground pool cleaners available on the market today. But how will you determine which is the best above ground pool cleaner and which particular type will work for your pool? Read on to the next section of this article and find out. Top 7 above Ground Pool Cleaners Today! 1 Top 7 above Ground Pool Cleaners Today! A wide variety of above ground pool cleaners are available on the market. We have conducted reviews on 7 products to help you choose the best pool vacuum. 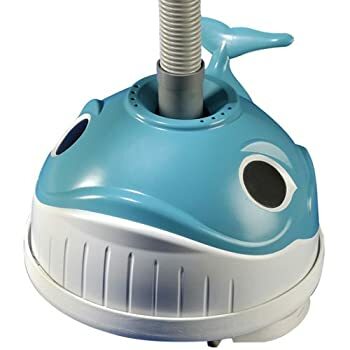 The Hayward Wanda the Whale suction cleaner has a unique turbine system and operates noiselessly. It is designed to automatically clean the bottom of above ground pool. It has a programmed steering system and ensures that the pool is completely cleaned in a quick manner. It can be installed in less than 10 minutes without the use of tools. 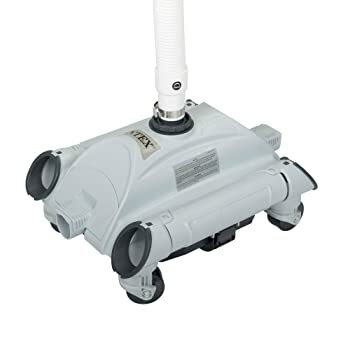 This product is a pressure side cleaner, and it makes use of water pressure to get rid of pool dust and debris. This works primarily on above ground pools, especially Intex pools. This can also be used with other pools provided that an adaptor is purchased separately. It can clean debris and sand from the pool floor. It has a skimmer basket that traps floating debris. It requires filter pump with 1,600 GPH to 3,500 GPH flow rate. It is portable and fully automated. The Zodiac Ranger is a suction side type of cleaner that is affordable and dependable. It can thoroughly clean your pool by removing the debris and dirt. Also, this does not require extra tools to install. It comes with AG disc that allows the cleaner to effortlessly glide on the sides and bottom of the pool. It works effectively, quickly, and quietly. Water flow can be regulated with its self-adjusting flow control valve and ensures peak performance. Polaris’ best pool vacuum is powered by water pressure from your pool’s pump. 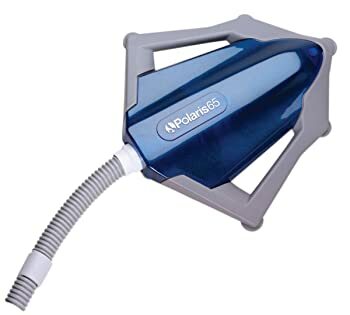 This pressure side cleaner is made for cleaning fiberglass or vinyl above ground pool up to 5-feet deep. It comes with a filter bag that can trap large debris even in the hard-to-reach surface of the pool. The jet sweep loosens debris by blowing the water against the pool wall and sweeps them into the filter bag. It operates with the filtration system and pump of the above ground pools. The Kreepy Krauly E-Z Vac cleaner is the most popular and the best suction pool cleaner. It comes with a flapper for long and dependable service. Water flow is regulated with the skimming valve to ensure cleaning speed and skim surface debris and vacuums simultaneously. It is designed to work flawlessly on dish-shaped and flat-bottomed pools. It is designed to produce optimum vacuuming power. This is perfect for above ground pools of any shape. 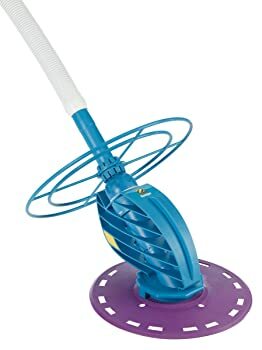 It has a self-contained filtration system and internal pump that can vacuum debris in less than one hour without hoses. It can remove algae and large leaves. It comes with a built-in reusable filter bag, a floating cable, and a power supply transformer. It has a 2-hour auto shut-off mechanism. It has non-marring wheels and can move smoothly on irregular swimming ground. This product works at the bottom and around the pool. It can handle large debris like leaves and removes dirt with ease. This vacuum can handle pools sizes up to 16’ x 32’. This is easy to install and maintain. It can be connected directly to your existing filtration system without the use of any tools. Its suction power comes from the filtration system; thus, it will not require the use of an additional electrical outlet. It only requires a pump with 1,600 GHP for it to function properly. Pool cleaners are efficient and effective in maintaining a healthy and hygienic pool. The types of pool cleaners include suction side, pressure side, and robotic. This type of cleaner cleans in an undirected pattern. It also takes time to clean the whole surface of the pool. This work well on pools which corners are not sharp. If your pool has curved walls, this is an excellent choice. This type of cleaner moves in a pre-set pattern and cleans the surface of the pool in the shortest time. This works well on smaller pools as it can get easily on tight corners. The best suction pool cleaner is good for pools with existing pumps and filters. Using this type of pool cleaner will require you to regularly clean your filter and use more diatomaceous earth. Also, the pool pump should be running as the suction side cleaner works, which means that you’re required to use more electricity. It is wallet-friendly as compared to other pool cleaners. It is easy to install and easy to maintain. It has few moving parts and works great on small to medium-sized pools. This type of cleaner requires a lot of suction to work. Requires frequent cleaning of the filter. It may fill up the skimmer box if left permanently and can cause damage to the pump. It cannot pick up larger debris such as dead leaves and pine needles. This type of cleaner is relatively advanced as compared to the suction side cleaner. This is more powerful as it uses pressure to drive the cleaner into the pool and forces the debris into the filter bag where it can be collected and removed. The pressure side cleaner comes with a filter bag for debris and makes the cleaning process faster. It does not require frequent cleaning on your pool’s existing filter. Adding a booster pump will make this cleaner more powerful. 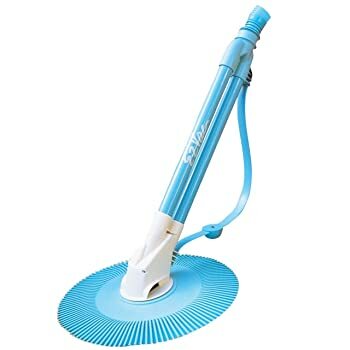 This type of cleaner is great for picking up medium to large pool debris. It works fast and powerful. This effectively works on larger debris. The hose is less likely to tangle, thus easier to manage. It is equipped with filter bag, so it does not add up stress on existing pool filter. It’s a little expensive as compared to other cleaners. It may require an additional booster pump to operate. It may damage the filtration system if it is directly connected to the pool’s existing pump. A robotic cleaner is the best and the most expensive type of pool cleaner. This type of cleaner has an internal pump and self-contained filtration system. This means that it doesn’t add extra strain on your pool’s existing pump and filter and reduces the running cost and time in cleaning the pool surfaces. It can grab all sizes of pool debris, which makes it efficient in cleaning your pool. Depending on the model, some robotic cleaners have features like programmable cleaning cycles, remote controls, four-wheel drive, and waterline scrubbing. This works best with above ground pool with no skimmer basket. It has a self-contained pump and filtration system, so it does not wear on the pool’s pump system. It is recommended for larger pools. 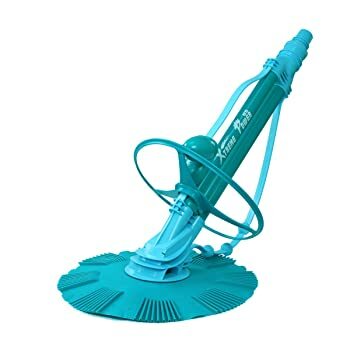 It is the most expensive automatic pool cleaner. Filters are required to be emptied for the unit to work. Out of all the three types of above ground pool cleaners, the robotic cleaner is the best above ground pool cleaner. Yes, it is a little expensive compared with the suction side and pressure side, but the features of the robotic cleaner make it worthy of an investment. Also, there are robotic cleaners that are basic and way cheaper than the advanced models. 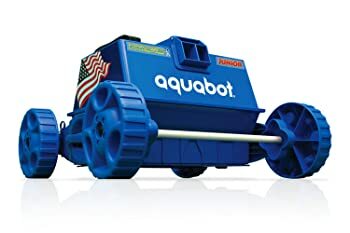 From the 7 above ground pool cleaners mentioned above, the best by far is the Aquabot Pool Rover Junior Robotic APRVJR. It is more advanced as compared to the other products, and it does not require additional equipment to maintain the cleanliness of your pool. It is quick to set up and easy to use. The Aquabot Pool Rover Junior Robotic Cleaner works independently and requires less attention. Through smart technology, its movements can be programmed to maneuver all surface of the pool. Moreover, its durability and efficiency make it an excellent value for your hard-earned money. So, if you are aiming for an efficient pool cleaning experience, we recommend the Aquabot Pool Rover Junior Robotic Cleaner. You can check the product here, and let us know what you think!